We recover a large amount of data from an external database (SQLServer, about 1 million rows in JDBC). However, we have treatment time issue. This process takes more than 30 minutes whereas on a "classic" SQL Server Management Studio type request takes less than a minute. It explains how in Java, we can tweak the FetchSize parameter of the JDBC driver to optimize this kind of process. Is there a way to access this JDBC parameter through the EnsLib.SQL.OutboundAdapter adapter? IRIS and Ensemble are designed to act as an ESB/EAI. This mean they are build to process lots of small messages. But some times, in real life we have to use them as ETL. The down side is not that they can't do so, but it can take a long time to process millions of row at once. To improve performance, I have created a new SQLOutboundAdaptor who only works with JDBC. Extend EnsLib.SQL.OutboundAdapter to add batch batch and fetch support on JDBC connection. 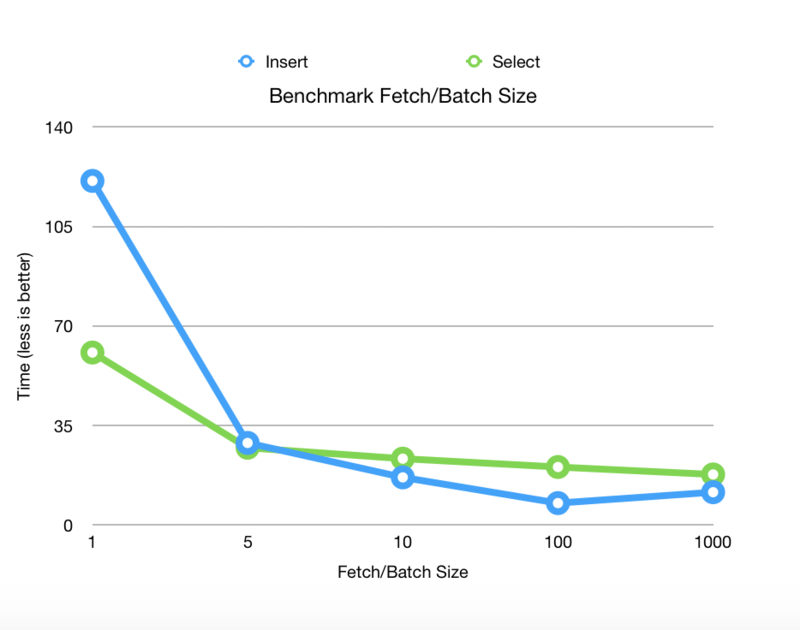 Benchmarks released on Postgres 11.2 with 1 000 000 rows fetched and 100 000 rows inserted on 2 columns. Can be used on IRIS or Ensemble 2017.2+. valid Token we keep receiving Authorization Error codes HTTP 401 back. successful and we are able to move past the authorization stage. The SOAP action specified on the message, '', does not match the HTTP SOAP Action, 'http://<expected target service action follows here>'. Further investigation using ^ISCSOAP and a comparison with other working environments reveals that the SOAP request is completely missing the <SOAP-ENV:Header> element. This absence of a SOAP header occurs for multiple Operations in more than one Namespace for this newly migrated server, yet it is present in every other environment, all of which use the same source code. I am having an intermittent issue that when I make a call to MSSQL from a BPL that the response does not come back in the amount of time required. Since the call from the BPL is synchronous I tried changing the timeout to 60 but it has not helped (see below). Is there anyway to guarantee that the call waits long enough for a response before continuing on? I created a Business Operation to Integrate with Amazon S3. I have used HTTP Outbound Adapter for the same. Used Get method of Adapter Class. Basically in a request I want to send Unique File Name and File and in Response I want to get Version ID and if operation was successful, then set flag to true. 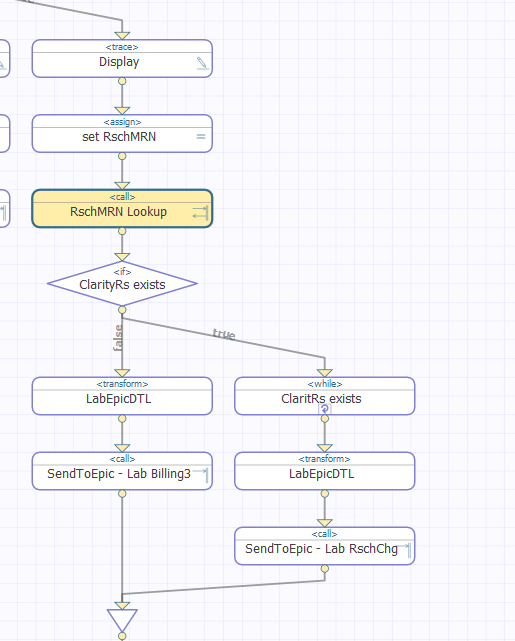 Running predictive models natively in an InterSystems IRIS Business Process has of course always been the goal of our PMML support, but somehow never made it into the kit because there were a few dependencies and choices that needed addressing and answering. Anyhow, thanks to some pushing and code kindly provided by @Amir Samary (Thanks again Amir! ), we finally got it wrapped in a GitHub repo for your enjoyment, review and suggestions. I'm writing a SOAP client in Ensemble (2017.2.2) that is required to pass empty elements to the SOAP server in the form <xsi:type="ns:ResponsibleUser"/> where ResponsibleUser is a class that itself has no properties. I initially thought I'd found the answer with the XMLIGNORENULL parameter of XML enabled classes but this didn't make any difference for SOAP requests, only working when I wrote the XML to a file. Then I came across the XMLIGNORENULL parameter for the SOAP client class (inherited from %SOAP.WebBase), but this only works for %String properties and not for properties of arbitrary class types. Is there a way to force the output of an empty object-valued property as an empty element in a SOAP request? I created the Process to extract the required data from ADT message to a Dynamic Object. I wanted to send the JSON stream to EnsLib.File.PassthroughOperation operation and generate a file with the content of JSON stream. but I am a bit confused about how to go about doing it. Since they don't have a wsdl, this means it is a REST web service correct? or is it considered an API call? When I read the documentation it feels like it is more geared to building REST services/operations within Ensemble then connecting to one on the outside, am I missing something here. Can someone help clarify this for me? Is a API considered a Web Service? Am I missing something in the Documentation? 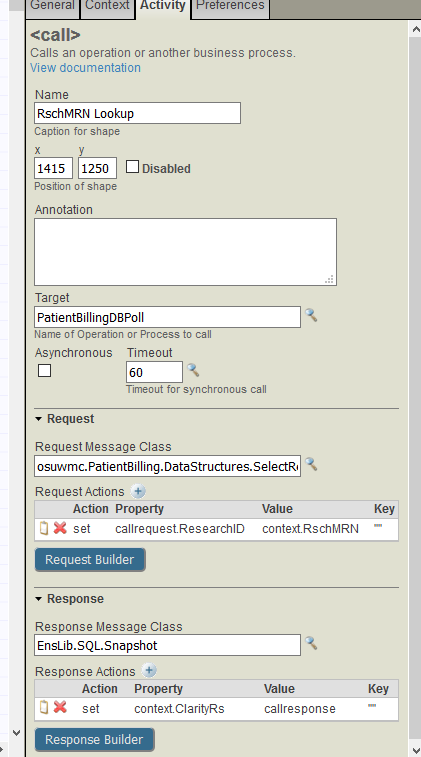 Is their a way to queue messages in a business operation to be processed later? I want to process messages over a certain size on a schedule, but let everything else process in real time. Is their a way to do this with one business operation or would I have to queue the large messages in a different business operation? Totally new to IRIS and Cache. Trying to evaluate it and work out how we could use it. As a standard application database. Object or relational etc. does not matter. 1) Can we develop, maintain and use an IRIS database and never use ObjectScript i.e. use only Java, Python, C++ interfaces etc. (exactly which one does not matter)? Would that make designing and using the IRIS database more prone to inefficiency and error? 2) Can we import an existing Cache database into IRIS and convert its ObjectScript code into Java, Python whatever? Is that a big, difficult, error-prone job? If the answers are no that may not be a showstopper but would like to know it now. A lot of training will be involved in any case I know and Oracle has PL/SQL but ObjectScript developers are rare. I am working on my first REST operation concept and had a question about the Property Parameters. If I put a value in CAPTION, does that mean that when I use it in my call that it will come out in the URL? so when it builds the URL it looks like..
We have many sFTP business operations that work successfully. I just modified an existing one to point to a new IP and Port, as well as use new credentials (username and password only). When I attempt to sFTP a file, I receive the following error. We would like to retry message so that it's restored to end of operation's queue. This is in situation where order of messages is not needed to be handled by Ensemble, there is version number in message data and receiving application can ignore incoming message if necessary. We would try to send message until it's accepted (or manually suspended), but this should not block operation's queue. D - Disable the Operation, log an error and restore the message to the front of the Operation's queue. Q - Disable the Operation, log an error and restore the message to the END of the Operation's queue. This article will provide tips and tricks on customizing Ensemble business hosts with configurable settings. Ensemble production Settings are configurable values that control the behavior of a production and its hosts. Connections/ SOAP Operations to 3rd Parties can hold some challenges like the 3rd party changes it 's structures/ WSDL and returns an additional property in a SOAP response. So I have tried to implement the XMLIGNOREINVALIDTAG in the proxy SOAP response structures , but in Ensemble this seems to get ignored. Below is a simple alert processor based on the EnsLib.HTTP.OutboundAdapter to send text alerts via an SMS Gateway service. Typically, all that is needed to send an HTTP Post to the gateway service is the destination phone number, a source phone number, credentials, and the URL. I have been told that the media type should be "JSON"
how do I go about changing the media-type of the HTTP Request? I'm getting mad trying to get data from an external REST service that uses Basic Authentication from Ensemble. The BO worked fine when I was using a test server without authentification, but as soon as we need to go to production I cannot have it working. So far, I've created the username/password at the credentials page (Ensemble-Configure-Credentials). I've setup the BO to use this credentials. But nothing happens. I've tried with the Rest Client (addon for Mozilla), and using the same address, port and user/pwd works just fine. Is there any way to configure this? I have a question related with EnsLib.SQL.OutboundAdapter adapter. Is there a way to open an oracle transaction and do either commit or rollback depending on the query result? Is posible to keep open an oracle transaction to execute a lot of queries on different methods on the same business operation and do a commit when the business process finished? I'm trying to add an Operation to store DICOM files but each time I add a Operation using the class EnsLib.DICOM.Operation.TCP it reverts into Services and I cannot work out why this is happening. I've tried following the guide online (link at the bottom) but the Operation still reverts to a Service.